Below is a short note on the history of this beautiful C of E Parish Church. Click here for a history of the bells. The origins of both Keyworth church and parish are obscure. The present church, dedicated to St Mary Magdalene, was mostly built in the 14th century, but the list of incumbents goes back to 1268 implying that there was a church building in Keyworth before the present one. A century before that, between the 1130s and 1167, the Keyworth living - tithes, glebe and offerings - was given over to Thurgarton Priory, so presumably there was a church in existence then. This is the earliest reference found to a church in Keyworth. 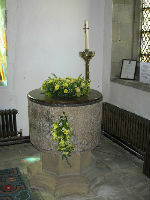 The font in the present church (above right) is thought to be Norman; it may have come from an early Keyworth church, or been brought from elsewhere. There are also the remains of a building in the grounds of what is today known as The Old Rectory (built in 1859) i.e. part of a stone wall with doorway, and several shaped stones, including two cusped arches, now flanking the driveway or used in a rockery. If the building was mediaeval or earlier, the fact that it was stone-built indicates that it must have been important - perhaps a former rectory, monks` cell, or even an early church. However, without further archaeological or documentary evidence, we can only speculate. There is no mention of a Church in the Domesday Survey (1086), though this is not unusual for places which are known to have had a church at that time. The village name, spelt Cauord in Domesday, is thought to be of Anglo-Saxon origin, probably meaning the enclosure (ord or worth) of Cau, but we have no pre-Norman documentary references to either the name or a church. There are no identifiable remains of a pre-14th century church. It was probably located on the site of the present building, though is unlikely to have been of identical plan. Footings of its walls may underlie the floor of the present church.